Enjoy 333 days of sunshine a year and on this Mexico Riding Holiday located between the famous pyramids of Teotihuacan, the UNESCO site of San Miguel de Allende and the lively metropolis of Mexico City. Enjoy wide open spaces great for gallops, margaritas by the pool and cultural visits to villages on this ranch vacation. A beautiful estancia vacation offering daily horseback rides across the pampas and the chance to play a few polo chukkas. This is the land of the horse where the culture of the gaucho is strong and where children still go to school on horseback. 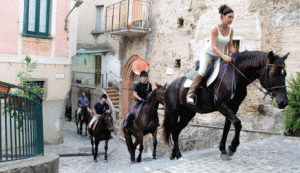 South of Amalfi, immerse yourself in the Italian lifestyle, eating beautiful food, drinking nice wines and horseback riding through rolling hills of olive trees and Mediterranean forests, to ancient villages and on the beach. 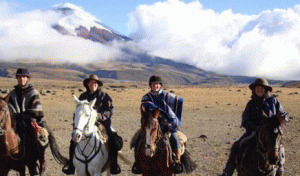 Horseback riding Ecuador! Visit colonial haciendas, ride the "Avenue of the Volcanoes", Cotopaxi Volcano, and get to know the culture and people of Ecuador. Stay nights at colorful and historic haciendas. 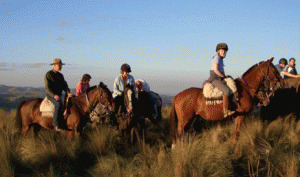 South Africa Horse Safaris based on a fifth generation ranch that's great for families. Varied horse riding experiences for all levels of rider, allowing for game viewing, cattle mustering, swimming with your horse, polocrosse, western games and jumping. 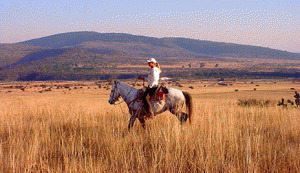 Includes combining South Africa and Botswana horseback safaris. 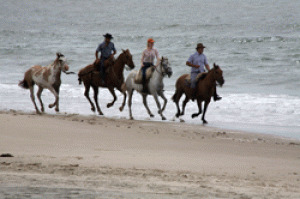 Beach and coastal trail riding vacations in Uruguay. Start in Montevideo and ride pristine beaches, emerald shores and a network of lagoons to coastal hills, sand dunes and pine forests. Visit the one of the most prestigious horsemanship schools in the world this summer!